S and I were at Whole Foods the other day, trying to stay focused, stick to our shopping list, and ignore the siren’s call of the bulk aisle, when he casually asked me whether I would be making granola again anytime soon. I opted to interpret that as a thinly veiled request and decided it was the perfect opportunity to play with a granola flavor I’d wanted to try for a while: gingerbread. This granola took two attempts to perfect. I tried to get fancy with the first batch, substituting my beloved raw buckwheat groats for some of the oats, going a bit wild with the spices, and playing fast and loose with the oven temperature. The result was a crumbly, overly ginger-y, and slightly burnt batch. Don’t get me wrong; I still nibbled the crap out of it as I prepared the second batch. And that second batch was much improved. Preheat oven to 300˚ and line a flat baking sheet with parchment paper. In a small saucepan, add the coconut oil, molasses, and maple syrup or brown sugar. Stir to combine, heating over low so that the oil melts. Once all ingredients are well mixed, turn off the heat and set aside. In a large mixing bowl, add all the dry ingredients. Pour the wet mixture into the dry ingredients and mix with a large wooden spoon. Once the dry ingredients are thoroughly mixed and coated with the wet ingredients, pour the granola onto the prepared baking sheet and bake for 30-35 minutes, removing from the oven and stirring every ten minutes or so. Remove from the oven and let cool for at least ten minutes before eating. Note: If you prefer a sweeter granola, feel free to reduce the molasses by a tablespoon. Second time’s the charm, I guess! (Although I have to admit that I did slightly burn this batch as well… oy.) I imagine this granola would be fantastic atop a bowl of vanilla soy yogurt—the spicy flavors would play perfectly with the sweet, cool yogurt. Sans yogurt, you’re looking at nearly 17% of your recommended daily value of calcium in a serving, along with 6 grams of protein and 19% of your recommended daily value of iron. Adding a 6-ounce carton of soy yogurt will increase your calcium intake by about 30% of your RDV, depending on the brand. Take that, Whole Foods. great recipe! 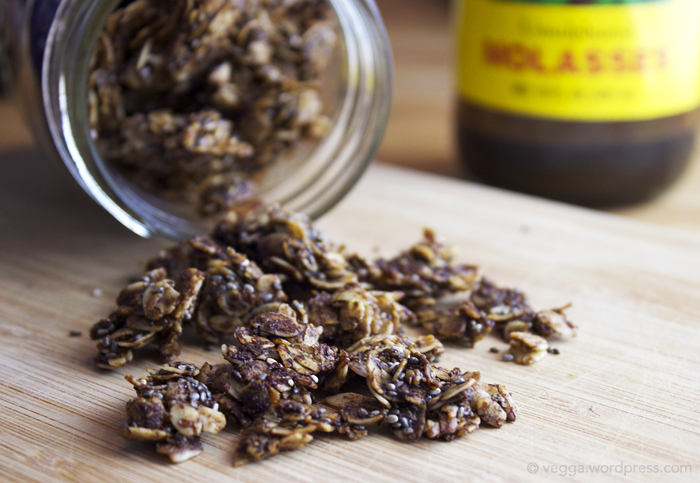 I love adding blackstrap molasses to stuff and granola rocks. whoa! 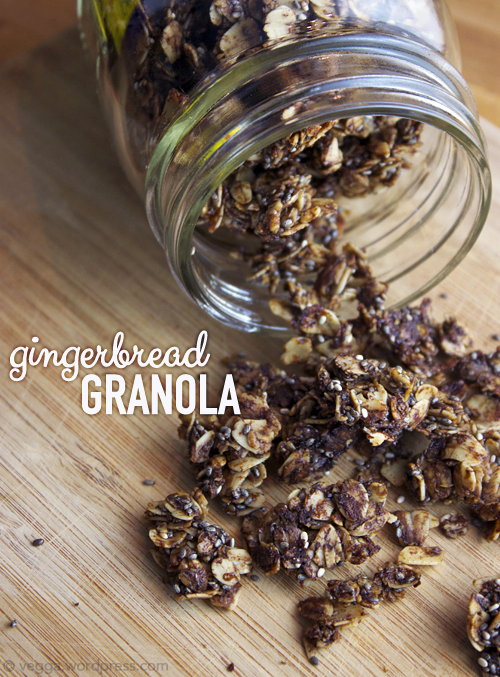 that granola sounds amazing. i love gingerbread flavors so much!